The MEP and Co-President of the Euro-Latin American Parliamentary Assembly (EuroLat) of the European Parliament, Ramón Jáuregui Atondo, has defended Europe and Latin America joining together in his opening speech as member of the European and Ibero-American Academy of Yuste, “in the defence of reason and rationality of the responsibility towards citizens, and the democratic and humanist values that both continents share in order for them to progress”. Jáuregui received the Yuste academic medal in a ceremony held today in the presidency of the Government of Extremadura in the course of a ceremony chaired by the president of the Government of Extremadura, Guillermo Fernández Vara. Furthermore, the Co-President of EuroLat highlighted that his love for Latin America was “late but full of maturity and emotions,” and named some of these such as the kindness of Latin American people; the strength and the dignity they have for bearing poverty or bad governments; the firmness of their convictions regarding justice and democracy, and the magic of their writers. Finally, Ramón Jáuregui highlighted that the link between the European Union and Central America goes beyond the collaboration and being commercial and economic partners, “we are joined by five centuries of communal history, a culture and some languages that crossed the Atlantic which returned enriched with new words and accents.” On this matter, he paid homage to the writer Stefan Zweig – his predecessor as a Yuste academic in the academy. Zweig, born in Austria-Hungary in 1881, and died in Petrópolis, Brazil in 1942, was a Jewish writer, biographer and social activist from Austria who left an inhabitable Europe behind to settle in America in order to keep thinking and writing, until he took his own life six months later after arriving to Brazil. Ramón Jáuregui explained that Zweig devoted himself to the idea of a culturally united Europe, and the search of world peace, but these didn’t materialise, which led him to take his own life. He explained that he chose the name of this writer due to “his Europeanism, for being persecuted, for being a writer and for his anti-fascism,” and added that his memory was, and is, an alarm signal “before a world which doesn’t find its order, peace nor balance,” and less so with the return of authoritarianisms and the new outbreak of nationalisms. Ramón Jáuregui was named academic of the European and Ibero-American Academy of Yuste Foundation on 30th July 2018 by the foundation’s Board of Trustees. Both the European side and the Ibero-American side of the Yuste Academy are strengthened due to this designation. Jáuregui is a man with an extensive career and has carried out important posts, highlighting his commitment in the European integration process and his work for strengthening bridges and links between Europe and Latin America to make progress in a shared agenda regarding the large communal challenges in both regions. For her part, the Ibero-American Secretary General and Yuste academic, Rebeca Grynspan, referred to Ramón Jáuregui as a man who incorporates “inclusive identities”, as opposed to one identity excluding another, as he is from San Sebastian, Guipuzcoa, the Basque Country, Spain, Europe and Ibero-America. In this sense, Grynspan highlighted the “relentless commitment” that he has had with Europe, Ibero-America and Extremadura. Finally, the president of the Government of Extremadura, Guillermo Fernández Vara, claimed during his intervention that “the world needs more room for thought, and less of the shouting,” which is why the Europe and Ibero-American Academy of Yuste is a “magnificent instrument of collective reflection, and we feel proud to have it”. 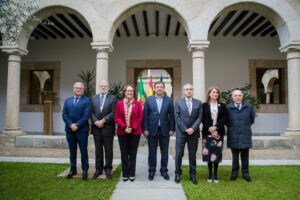 The ceremony was also attended by diplomat, politician, Yuste academic and Carlos V European Award winner, Marcelino Oreja, former president of the Government of Extremadura and Yuste academic, Juan Carlos Rodríguez Ibarra and ex-president of the European Parliament, José María Gil-Robles, among other authorities. This entity of an honorary and consultative nature is made up by a maximum of fifty academics at the service of the foundation’s aims. Members of the academy are European and Ibero-American public figures with renowned intellectual and cultural prestige who hold the distinction of Academic at the Europe and Ibero-American Academy of Yuste. This designation is intended to distinguish those who stand out due to their creative work or research, which drives the construction of communal cultural heritage and the advancement of science. Some Yuste academics are painter Antonio López; historians, Paul Preston, Carmen Iglesias and Manuela Mendonça; theologist, Han Küng; scientist, Margarita Salas and sociologists Abram de Swaan and Alain Touraine, among others.